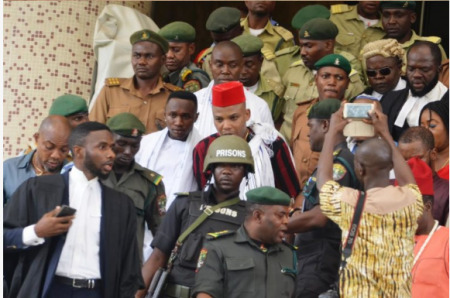 After over a year in detention, the leader of the Indigenous People of Biafra (IPOB), Nnamdi Kanu was granted bail by a Federal High Court sitting in Abuja on Tuesday, April 25. Kanu was granted bail on health grounds with strict bail conditions which some have described as ‘unfair’. Following the court’s verdict, some Biafra supporters across the country have taken to the streets to jubilate. 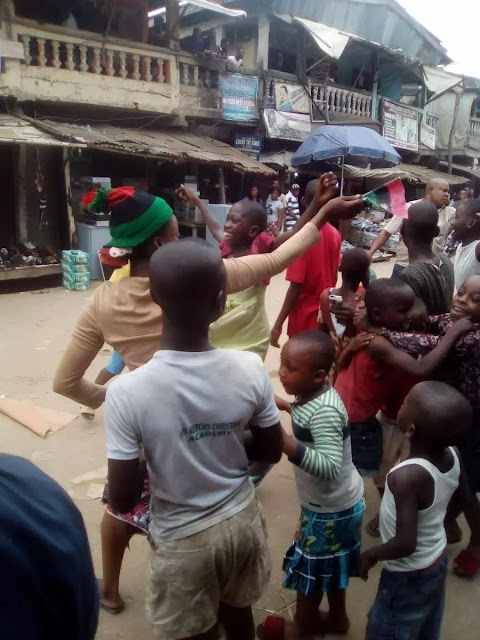 The atmosphere in Port Harcourt, the Rivers state capital is that of excitement as pro-Biafra agitators are on the streets celebrating. 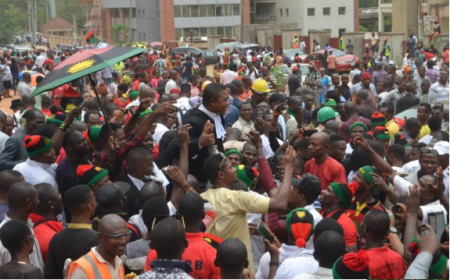 They came out in their numbers to celebrate Kanu's release. Aba in Abia state is no different as there is excitement and wild jubilation among the people. 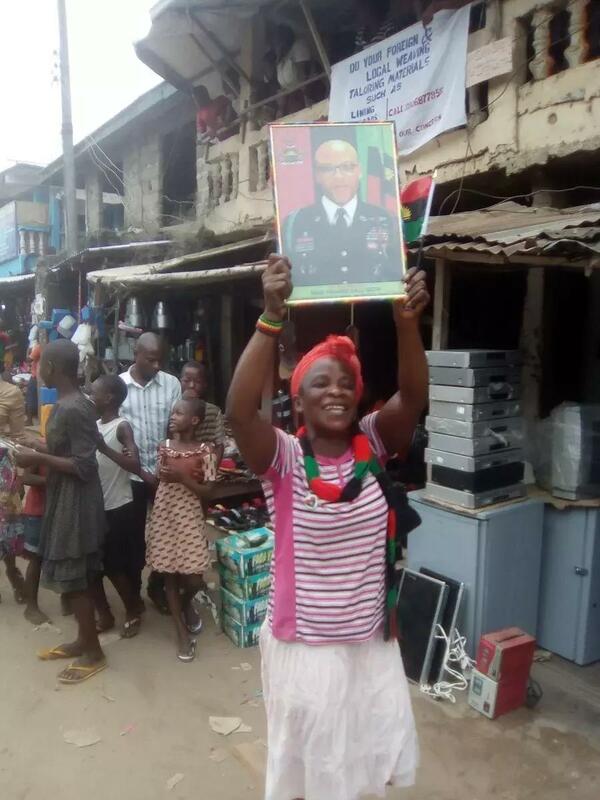 Residents of Aba trooped out in Jubilation after reports surfaced that Kanu had been granted bail. 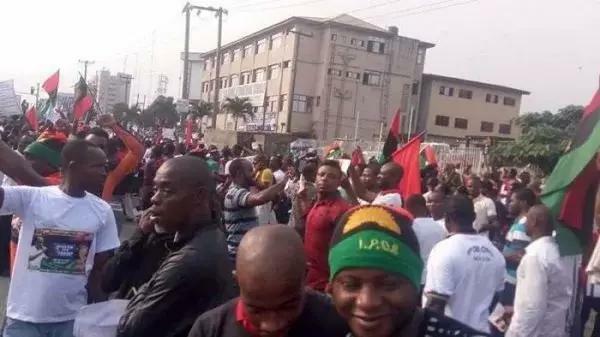 Biafra supporters in Abuja were also not left out of the celebrations. Following the bail granted to Kanu, there was unusual traffic in Abuja. There was heavy gridlock on the Abia House Junction at Ahmadu Bello way. 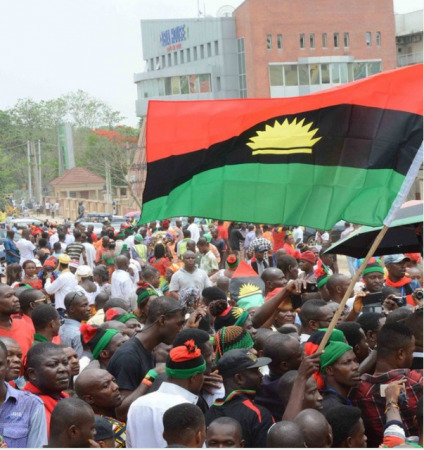 Many Nigerians parked their cars by the roadside to rejoice with some Biafra supporters who had just come out from the court premises. Watch the video of Nnamdi Kanu in court today below. 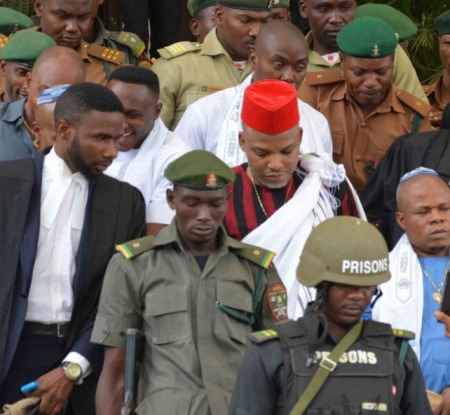 In a brief ruling, Justice Binta Nyako said that she was convinced that Kanu was ill and needed more medical attention than the Nigerian Prisons was giving him. “So I am minded to grant him bail so that he can attend to his health and face his trial alive,” Nyako said. She added that one of the sureties must be a senior highly placed person of Igbo extraction such as a senator. The other surety must be a highly respected Jewish leader since Kanu said his religion was Judaism, while the third person must be a highly respected person who owns landed property and is resident in Abuja. 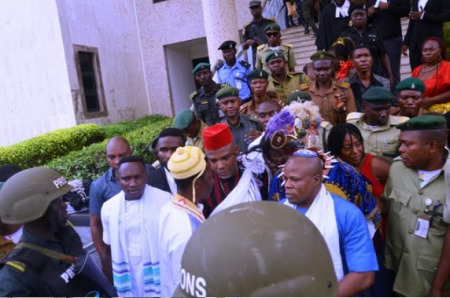 However, she refused bail to the three other defendants standing trial with Kanu, namely Chidiebere Onwudiwe, Benjamin Madubugwu and David Nwawuisi. The judge maintained that the only reason she admitted Kanu to bail was because of his ill health. She said that although the charge of terrorism had been struck out against the defendants, the charge of a treasonable felony hanging over them was a very serious offence. Based on this, she said she would stick to her earlier ruling that as long as the witnesses were security personnel, they would testify behind a curtain or wear a mask. She adjourned the matter till July 11 and 12, for a definite commencement of trial. The News Agency of Nigeria (NAN) reports that Gov. Ayodele Fayose of Ekiti State, and former Minister of Aviation, Mr Osita Chidoka, were in court according to them, as a sign of solidarity with Kanu. Kanu was arrested in 2015 on an 11-count charge bordering on terrorism and treasonable felony.Six of the charges, including that of terrorism were struck out early in 2017. Kanu had also been previously granted bail by Justice Adeniyi Ademola but was never released by the Federal Government.